Greece has been one of the first cradles of Christianity and therefore all Greek Orthodox Shrines are integral parts of our National Heritage, being at the same time a notable attraction for travelers from around the world. Orthodox Churches from early Christianity years, Byzantine times and later, with extraordinary icon paintings on fresco or mosaic and unique relics, prove the direct spread of Christianity throughout Greece. Remarkable are also the Orthodox Monasteries around Greece that played important role not only spreading Christianity, but helped in the preservation of Greek literature and the arts, with examples from the Ottoman rule period, when the clergy men created the "Secret schools” supposedly illegal underground schools for teaching the Greek language and Christian doctrines, where hope for freedom flourished and the poor Greeks were also finding sanctuary helping with cultivating peaces of land belonged to the Monasteries and getting some income from the crops. 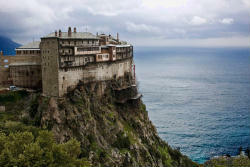 The Orthodox Monasteries of Mount Athos and the ones built on natural sandstone rock pillars called Meteora, are included on the UNESCO World Heritage List. All around Greece the visitor has the opportunity to admire Byzantine basilica churches and early Christian chapels build on top of Greek ancient temples, coexisting in one mosaic of cultures and religions. Another very important role have the religious museums created in several Greek Churches and Monasteries to preserve Greek Orthodox heritage, highlighting the strong link between art and religious worship and the important role of the church in Greek history. - Individual Pilgrims who have dominating religious motivations and they like to visit exclusively the religious sites. - Group Religious Travel, one of the best ways to develop community among people and we will be your best choice to plan a trip for your group, church or organization. 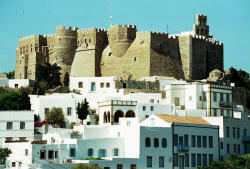 Pilgrimtours.gr offers a variety of religious destinations to choose from. Unique programs exploring Christian routes, walking the paths of the Apostles, to deepen your faith every step of the way on this spiritual journey. You simply decide which type of travel experience would most perfectly fit your group's, church, ministry or organization's interests. All our itineraries are tailor made to suit your group's needs and iterests. We will provide you with detailed schedule planning and services, making sure that you won't waste time or effort. Our long-standing presence in the market and religious travel co-ordination, guarantees that we offer excellent personalized services, combined with the best rates. Contact us for a unique Religious travel experience !